A few years back, Blue Canopy Group caught a break. Computer Sciences Corporation (CSC) needed a partner to provide an integrator tool for a lucrative contract with the Environmental Protection Agency. Blue Canopy was a small firm, and faced the challenge shared by many under-the-radar subcontractors: getting noticed by large system integrators and contractors like CSC. Blue Canopy, as its president Jeff White told it to FCW, caught a break because a CSC executive recalled that Blue Canopy had done great work for a previous employer. One thing led to another and Blue Canopy snagged a five-year contract for the EPA. And while the end result was favorable, one has to wonder if Blue Canopy would have had a chance if not for the executive’s memory; not because they weren’t qualified for the work and available to staff it, but because Blue Canopy would not have known CSC had this need and for their part CSC would not have known Blue Canopy could fill it. For the outside observer tracking the staggering dollar figures that flow annually between the government, large contractors and small businesses, it is easy to overlook the inefficiencies inherent to the system. 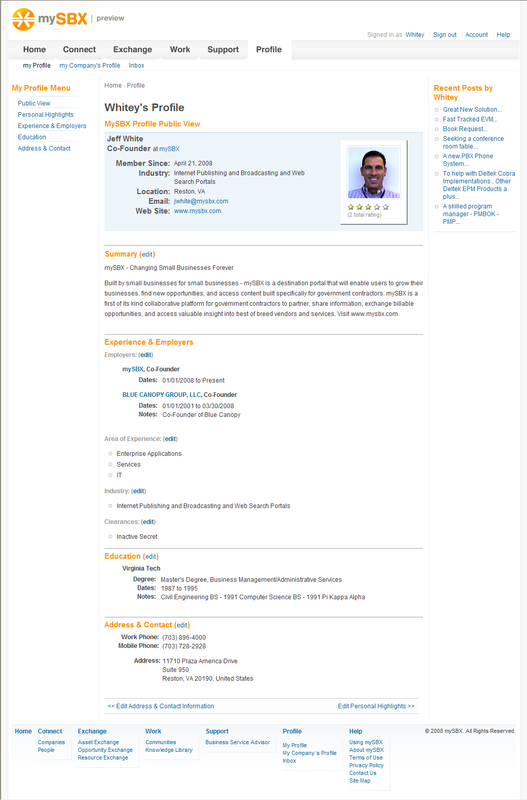 Agency dollars unspent, small business staffing resources left idle on the bench, and the inability of large providers to identify teaming partners outside their subcontractor network – as was the case in the example above – were all pain points White witnessed first hand from the time he founded Blue Canopy in 2001 to the day he sold it five years later. He knew there had to be a better way. Enter mySBX. At its core, mySBX is a destination portal for small and large government contractors to connect, collaborate and share information and opportunities. mySBX was specifically designed for small or medium size business struggling with resource utilizations, finding new opportunities, or improving the quality of their work and workforce. The portal launched May 20th and the site has already drawn tremendous interest from both large and small firms (ranging from providers with thousands of employees to one-person shops) in the government space recognizing that mySBX is offering a unique networking capability that had been lacking to date. The idea for mySBX was conceived by White and co-founder Bradley J. Schwartz, a seasoned veteran of the consulting and government space who served as the Group Executive Vice-President for BearingPoint before becoming President and CEO of Blue Canopy. Schwartz brings with the experience of directly managing a $3.4B P&L with 15,000 professionals operating in four regions and 34 countries. A key early backer is Deltek, Inc., a well-known provider of enterprise applications software. Deltek will be collaborating with mySBX and sponsoring two online communities – Earned Value Management and Cost Accounting Systems. 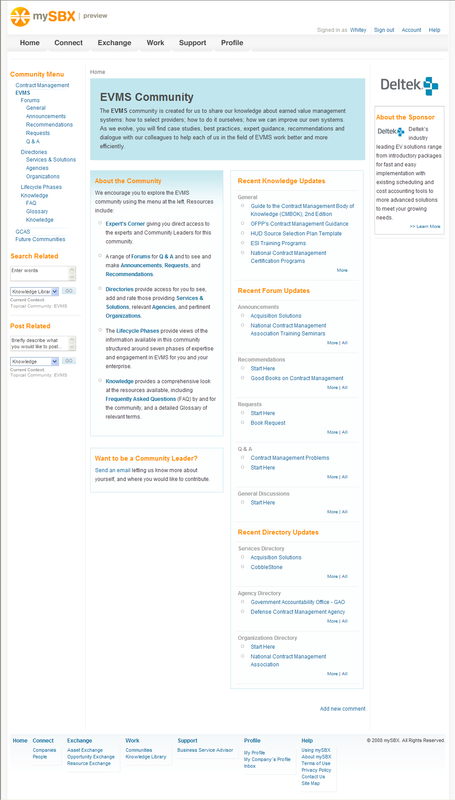 The two communities offer powerful features including an “Artifacts” section for hosting documents and training materials, as well as a “Directories” section of regularly updated and ranked source for community key players. The communities will also feature webinars on key issues, articles, blogs and data. For Deltek, it can now enhance its value to customers with a destination for its user communities to collaborate and share best practices. Beyond the Deltek-sponsored communities, the portal will contain several robust, feature-rich networking communities covering the topics and issues most relevant to the government contractor community. Beyond the recent launch, White states that while the initial focus will be on the Federal marketplace, he hopes to extend the mySBX concept to the commercial space sometime next year. Joining the site is simple – and free. Simply click here, enter your name and email and you are in.